The first book ever to cheer on and cheer up home sellers in today’s tough housing market! 7 Innovative ways to attract the greatest number of interested buyers to your front door. How to make your house beautifully memorable while spending the least amount of time and money. How to get buyers and Realtors to put your home on the top of their viewing list, even if there is a glut of homes for sale in your area. 24 surprisingly easy touches to add outside your home that make house hunters stop the car, write down your number and set up an appointment to view it. How to describe your house to attract more buyers in a slow housing market. 8 big advantages home sellers get from working with a Realtor. 8 things to look for when selecting a great Realtor. How to get your home ready to show in ten minutes or less. 15 simple ways to keep buyers from rejecting your house. How to get the highest offer price possible — as quickly as possible. When to lower your price and when not to. How to reduce financial fears while your house is on the market. How to reduce anxiety and midnight anxiety attacks. 18 immediately useful ways to beat the home sellers blues. How to stay in control of your life instead of feeling stuck in limbo while waiting for your house to sell. How to make your home much more fun to live in while it’s on the market. 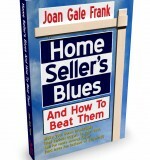 Home Seller’s Blues is available in paperback and as an ebook. Or order it here through Amazon.com, Barnes and Noble and the Apple iBookstore.